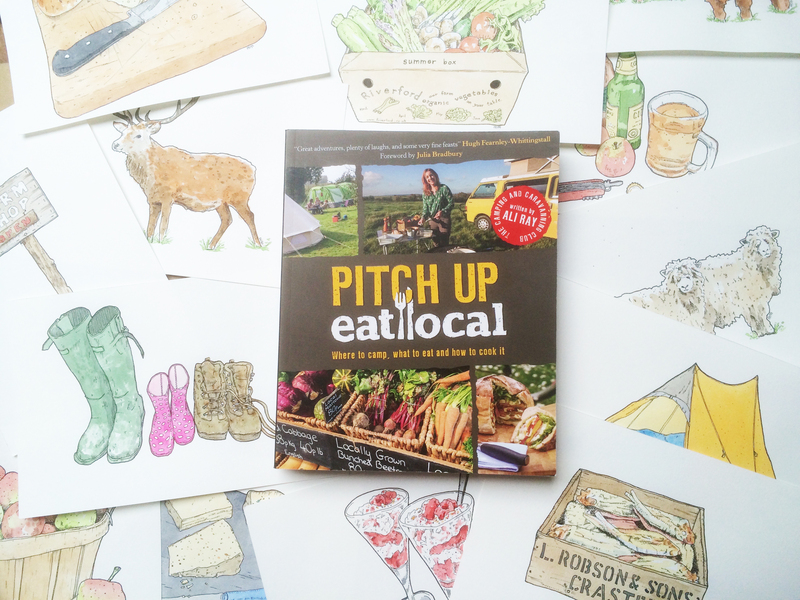 “Pitch Up, Eat Local” Official Book Launch – eek! It looks like we’ve got a lovely drive in the sunshine down from Yorkshire to Somerset. 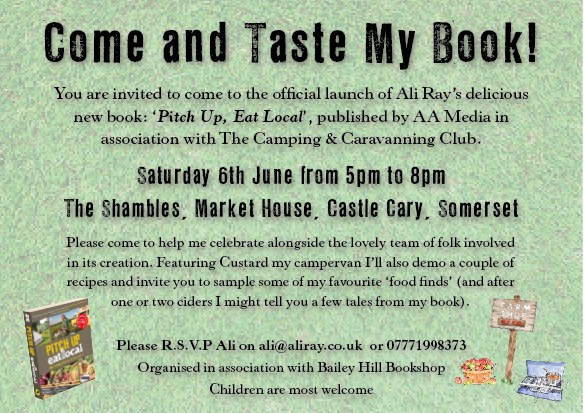 I’ve never been to a book launch before, not have I met Ali – so, an all round exciting day, then! I’ve been illustrating her articles for about three years and we’ve chatted via email and messenger, so it’s going to be fab to meet her in person. And to watch her in action – whipping up some recipes. Oh! I nearly forgot! I’ll get to meet her famous camper van, Custard, too. Maybe I’ll be able to sneak in a quick sketch of it too. It took me a while to pick up this book and read it; not because it’s got particularly long words in it, or anything, but it at 18cm x 23cm it’s a fairly large book – it somehow felt like a denser read – as if there were more words than normal. 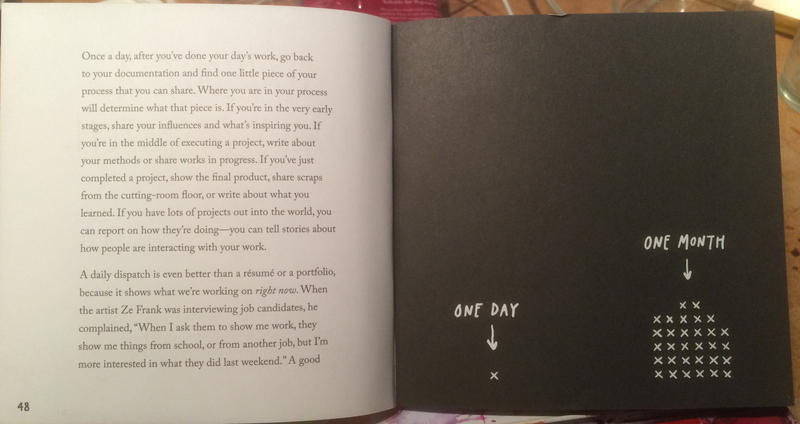 It’s a wonderful book with loads of really sage advice for any creative. 2 – Rituals of preparation – Being in the working state. 3 – Your creative DNA – How the way that you are hardwired is who you are and also how you approach projects. 4 – Harness your memory – Creation as a result of your previous experiences. 5 – Before you can think out of the box, you have to start with a box – About Twyla’s system of organisation of her ideas for dance choreography. This was a bit of watershed chapter for me – and has altered my approach to my own creative projects. 7 – Accidents will happen – About the value of having a plan before you start and the equal value of happenstance coming along – in creative endeavours luck is a skill. 8 – Spine – About the main idea of a creative piece and why the resulting pice doesn’t necessarily require that spine flagged up and explained. 9 – Skill – About building and growing skills in different areas. 10 – Ruts and grooves – and how to shake things up and get out of them. 11 – An “A” in failure -Why failure and disasters are important in order to move your work forward. 12 – The long run – Mastering your creative process by pursuing your work over years. I have to admit that in my relish at reading Twyla’s chapters- I didn’t always do all the exercises, which come at the end of each chapter. There are usually about three or four of these and they do seem very practical and useful. 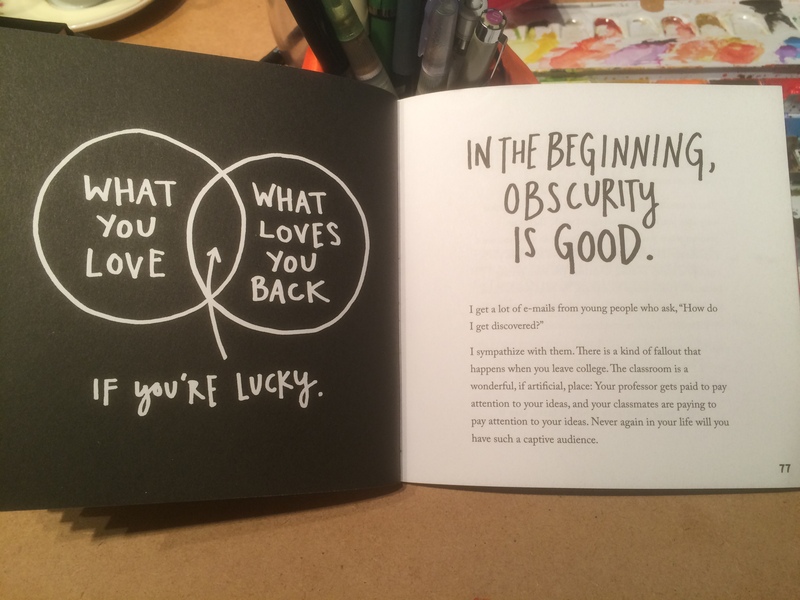 I would say that this is probably one of my favourite books about being creative – one that I have thoroughly enjoyed reading from cover to cover – but also one that I know I will refer to again and again. Well, May the 1st is finally here! 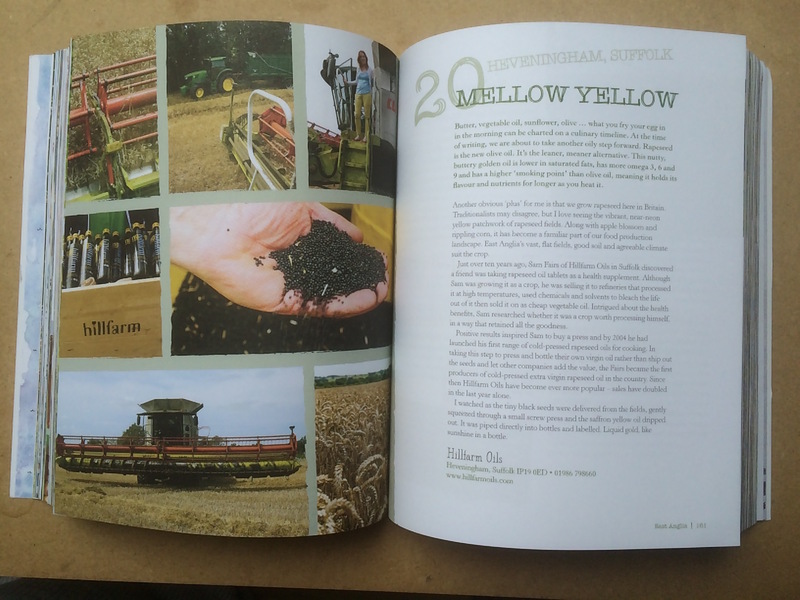 And with it a book is now available to buy. A book with my drawings in it! 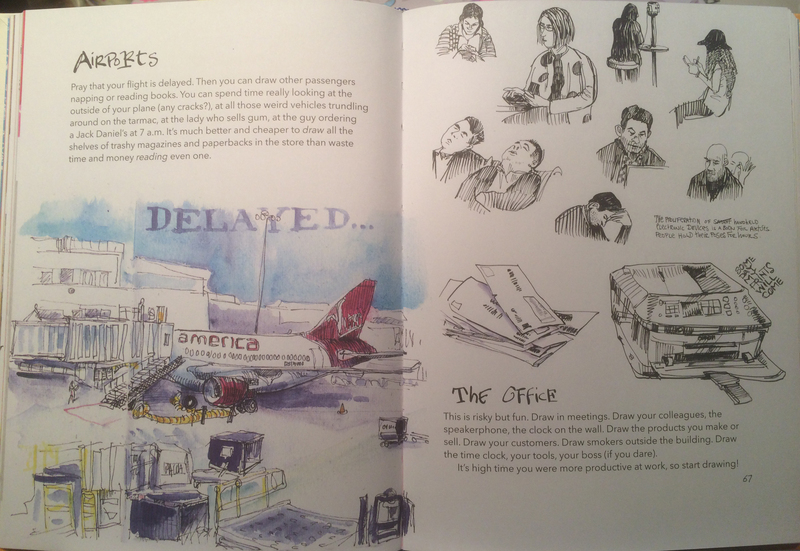 Now, before you all rush out to buy yourselves a copy – you need to know that it’s a fairy hefty book at 380pages and my drawings are quite wee, little things. Well, in the book they are! I drew at about A5 size. Basically it’s a gazetteer of England, Scotland and Wales. 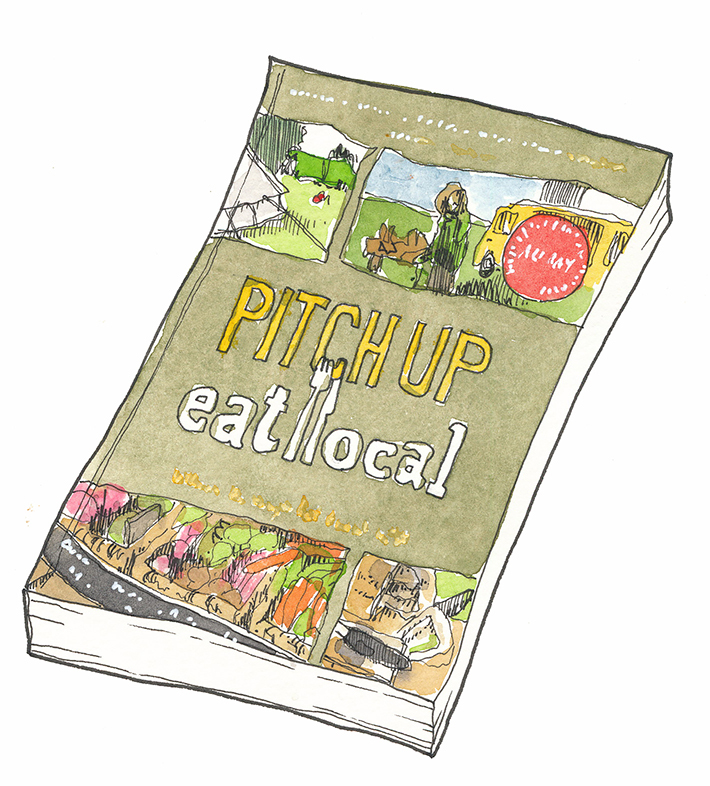 A gazetteer of the best bits of local produce. So there are sections on Cornish Clotted Cream and the Rhubarb triangle in Yorkshire. and then a recipe or two. 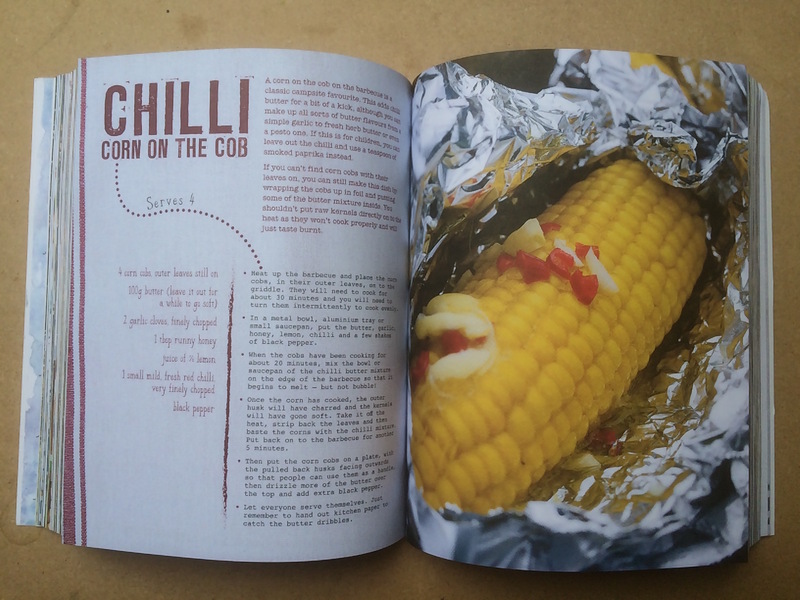 All the recipes can be prepared on a BBQ, or on a portable gas stove. It’s been a real roller-coaster of an experience, from my point of view, too. From initial phone calls last summer, to meeting up with the lovely people at The AA, to receiving a list of fifty things to draw and then powering through them. If you have a major cookery book in the pipeline and you’d like a friendly illustrator to work on adding a little quirk to the drawings … erm … here I am. 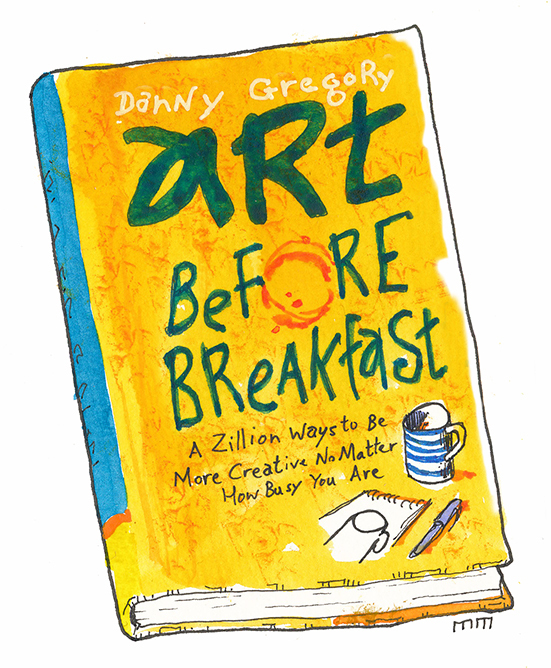 Danny Gregory’s new book has more in common with “The Creative Licence”, one of his first books about creative freedom. It isn’t really divided up into chapters or sections. 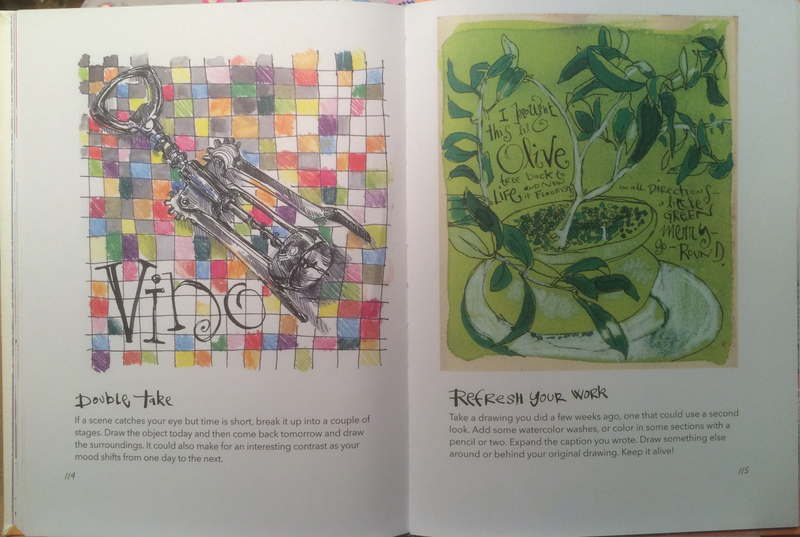 Instead each page, or double-spread, offers of suggested drawing subject, or idea, to get your inspiration flowing. It starts with a handful of very loose drawing lessons. Well, short drawing activities, really. Danny isn’t concerned with teaching the technicalities of drawing. But he is concerned with illustrating to you how easy it is to draw. How easy it is to find something to draw. 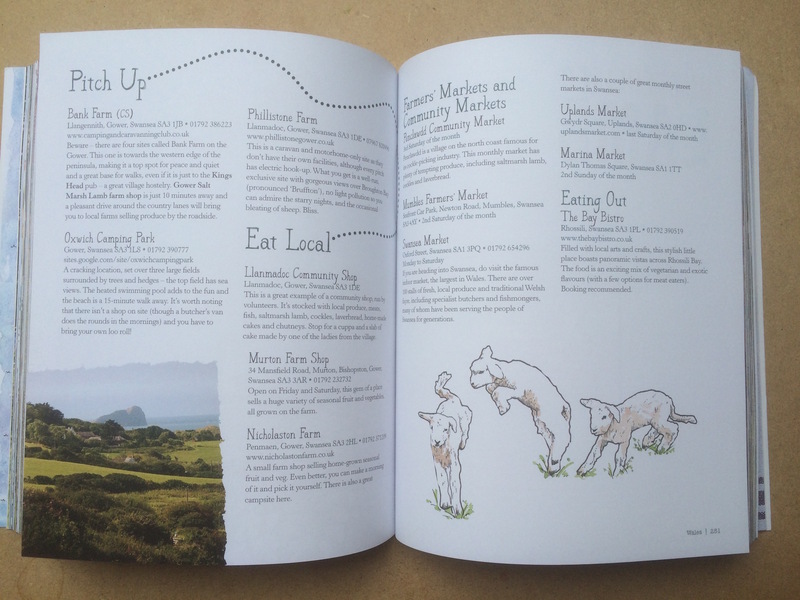 The rest of the book is a series of short prompts and thoughts on different subjects; from water-soluble pens to drawing unsuspecting people, drawing what you eat (Yey!) to drawing top tens. The cover reveals that this book is for busy people and it certainly is written for those too busy to pore over a long-winded art manual. Danny’s short prompts are brief and succinct, but still powerful. his message is clear; draw little and often. No matter what skill level you feel you are at. That doesn’t really matter. Starting that daily habit of drawing, even for just ten minutes a day, can have a profound, positive effect – can lead to a richer, more fulfilling life. This book would be a welcome addition to anyone who draws or who is thinking about drawing, at any level of proficiency. It is always welcome to be guided by skilled practitioners and to have so many bite-sized guides accompanied by Danny’s illustrations (demonstrating his economy of line and bravura colours) is a handy, pocket-sized guide. A journalling book in all but name! I bought Mike Rohde’s book initially because I like the idea of making practical, illustrative notes in meetings. Once I sat and started to pour over Mike’s book, however, the more I realised that, essentially, this book is a guide to speedy . Okay, it’s not exactly journalling. Mike’s sketch note idea is one of making very visual, and visually engaging, notes during meetings. Notes which can include character drawings, diagrams, bubble and 3D writing – radial paths and linear paths, modular like a comic strip or explosions of ideas like a spider-diagram. The book covers a wide range of ideas and many, many examples throughout of ways to make note-taking and enjoyable and rewarding experience. For the casual note-taker this might seem like a radical change in note-taking direction. To the sketcher and journal writer; I would say that this book offers a great many ideas for how your sketchbook or journal can be brought to further life through note-taking. 1. What are sketchnotes? – In which Mike explains his frustration with traditional linear note-taking and some examples are given off sketchnotes ion practice. 4. The sketchnoting process – In which we discover Mike’s seven steps in a sketch noting process. 5. 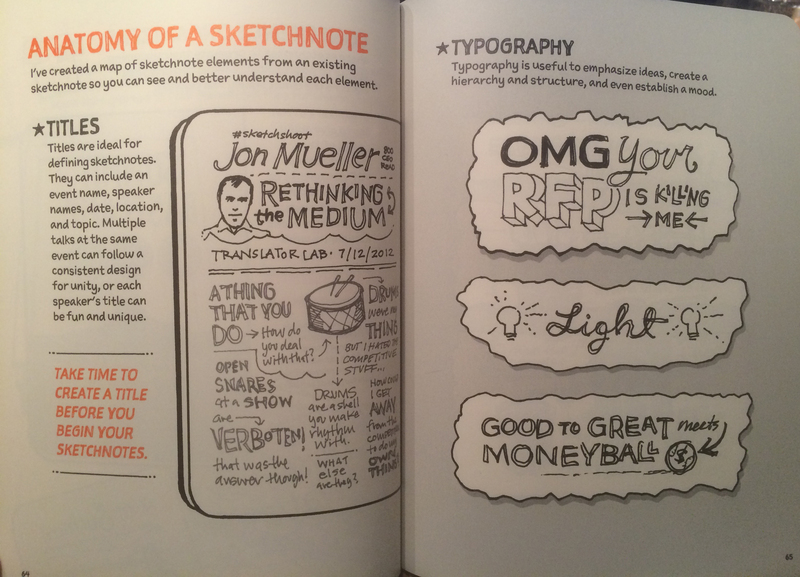 Types of sketch notes – In which we are shown different patterns of layout for sketchnotes. 6. Sketchnoting approaches, hierarchy, and personalisation – In which we find out different ways to sketchnote, some ideas about structure and how to make it personal to you. 7. Sketch noting skills and techniques – In which we are shown ways to letter, ways to frame and a variety of sketching tips to quickly capture figures and objects. 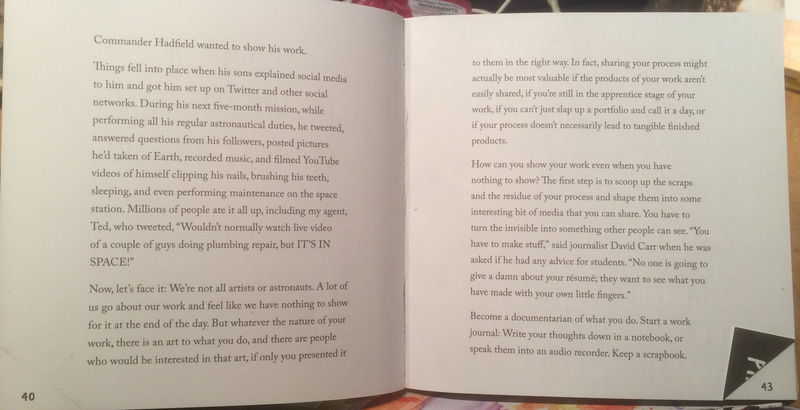 Austin’s first book, “Steal Like an Artist”, looked at the fundamental How of being creative. Once again, this is a book about being brave. If you’ve read Austin’s first book then you’re braved your inner voice to work on your own creativity. Now you can give that nagging inner voice something new to nag you about, by displaying your creative work to the wider, world-wide, audience. Austin doesn’t give specific examples of which platforms to use. But, then, that’s not the point of the book. Austin’s not concerned whether you use Twitter or tumbr, hashtags or Myspace (and, yes, I did choose Myspace on purpose!) He’s more concerned with getting the reader into the right frame of mind. You want to share your creativity, properly share your work to world, then you’re going to have to face that inner voice again, this time on the world’s stage. 4. Open up your cabinet of curiosities – Don’t hoard, share. 5. Tell good stories – Don’t expect your work to speak for itself. 6. Teach what you know – Share your trade secrets. 8. Learn to take a punch – Be ready to take the goo, the bad and the ugly comments once your work is out there in the world. 10. Stick around – There will be ups and downs – don’t desert your carnival stall, just because there are a few less customers at the moment. Another little gem of a book. I love these little pocket books that brim and bristle with good ideas and sage advice. 1. Steal like an artist – How to think like an artist and how to evaluate what are useful ideas. 2. Don’t wait until you know who you are to get started – Don’t wait until you know what you’re about before starting to be creative – start now and you’ll discover your way … along the way. 3. Write the book you want to read – Create things for yourself. Let everyone else catch up with your vision. 5. Side projects and hobbies are important – Things that you’re just messing around with, for your own amusement are often the things that take off. 6. 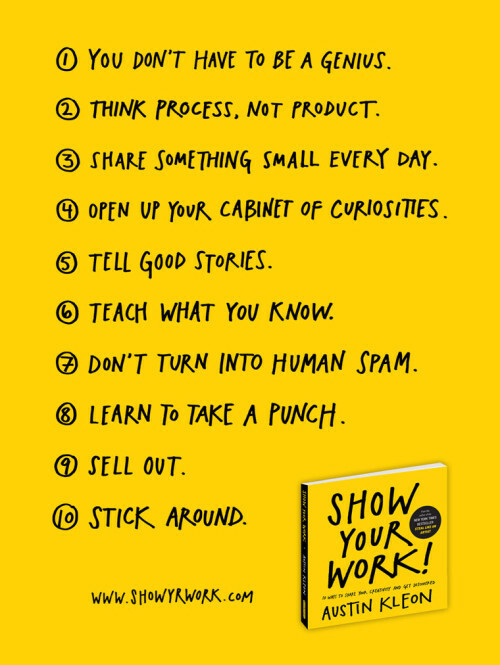 The secret: Do good work and share it with people – The secret to getting known. 7. Geography is no longer our master – How place can affect your work; from using technology to connect to getting out there and seeing the world. 9. Be boring. (It’s the only way to get work done) – Being regular and orderly helps your work. 10. Creativity is subtraction – Placing constraints on yourself to foster creativity. Austin’s book is, as I’ve said, a fairly quick read, so I’ve kind of skated across the ten things that he identifies, as I didn’t want to give you the potted version of the book, just a brief summary.